Looks to me like this latest Trump "Big Ugly" is a fizzer... like all the others! 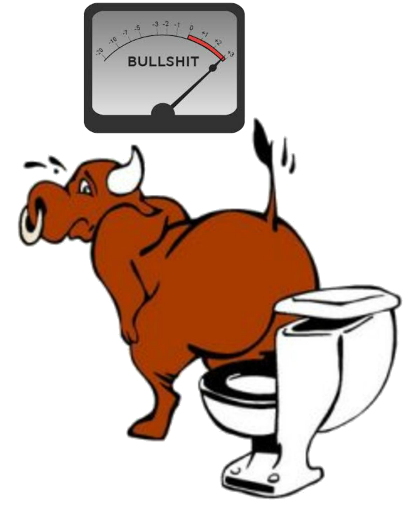 And as far as coughing up documents required by congress... we have another MEETING!... just to talk some more. The WH eg Kelly wont take part. Fan-Posters... Coffee break is over, back on your heads!! 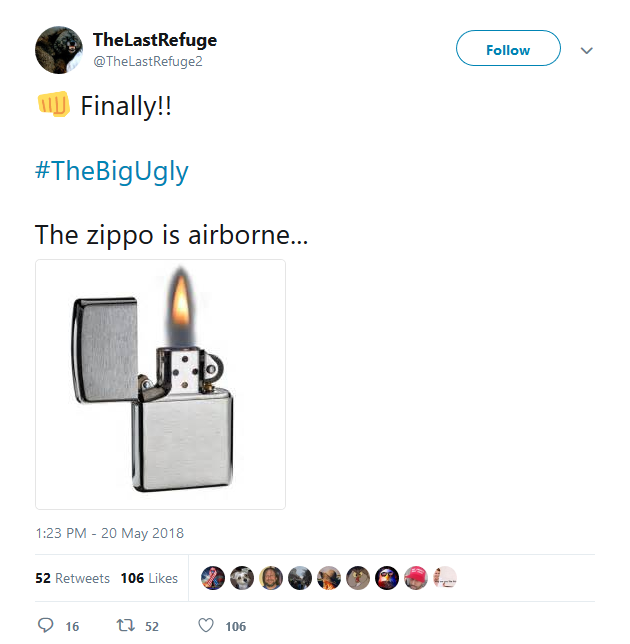 There wont be no "Big Ugly" as long as Sessions is there peeing on the Zippo!! 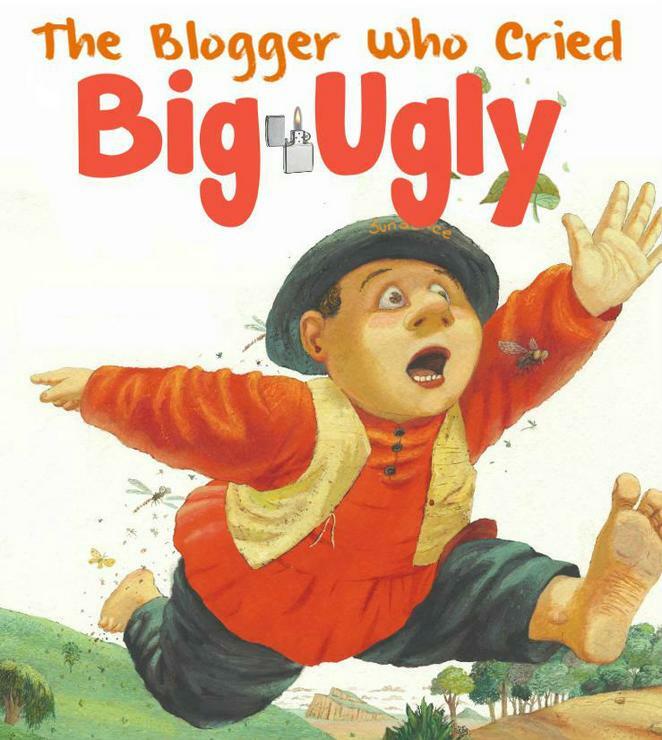 Another day, another "Big Ugly"? Maybe just a "medium-sized Ugly"
A contractor with a government agency was attempting to pass to him, through an intermediary, Hillary Clinton emails; and the intermediary reached out to Caputo to inform him therein. 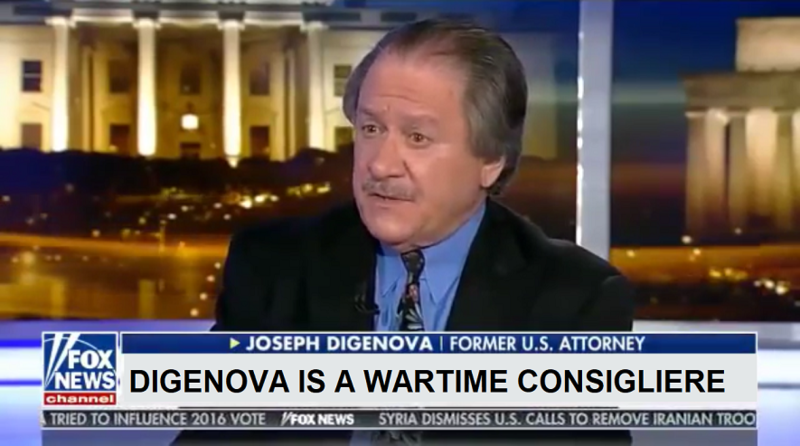 In hindsight, Caputo now suggests the “contractor of the government agency” was attempting to set him up -and by extension the Trump campaign- in a sting operation similar to the recently revealed “Crossfire Hurricane” operation conducted by CIA operative Stefan Halper through Carter Page and George Papadopoulos. Apparently the intermediary is willing to go on record explaining the contact from the government agency and the contractor therein. Additionally, according to Caputo, he has already informed the Mueller investigation of these contacts and apparently the Special Counsel is attempting to hide the evidence. A bit confusing since Admiral Mike Rogers, head of NSA is regarded as the only NOT CORRUPT head of Obama Intelligence agencies? But fan-posters are still fans! All my cards down. 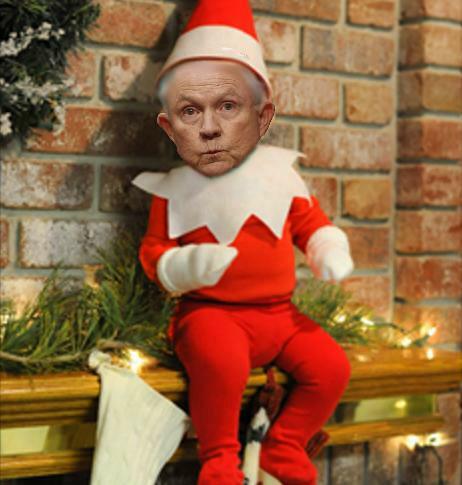 I bet on Sessions. Sessions is and was the crown jewel of senatorial endorsements. 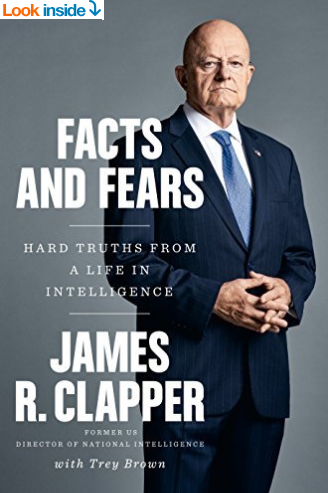 Clapper's book said to be "salacious and unverified"
Not really a surprise that CTH Cult fan-posters are a "Type" that follow "Q"
Can someone point me to a site (or Twitter handle) that has the latest Q posts with traslations? I have little doubt that a certain amount of "Deep State" dabbling goes on in every election. But.... in the 2016 election it went WELL beyond the normal "misdemeanor".. and way into Serious Criminality!! The criminality was on multiple fronts.... It had to be ORCHESTRATED by somebody... Obama himself ultimately... and certainly his closest WH staff. 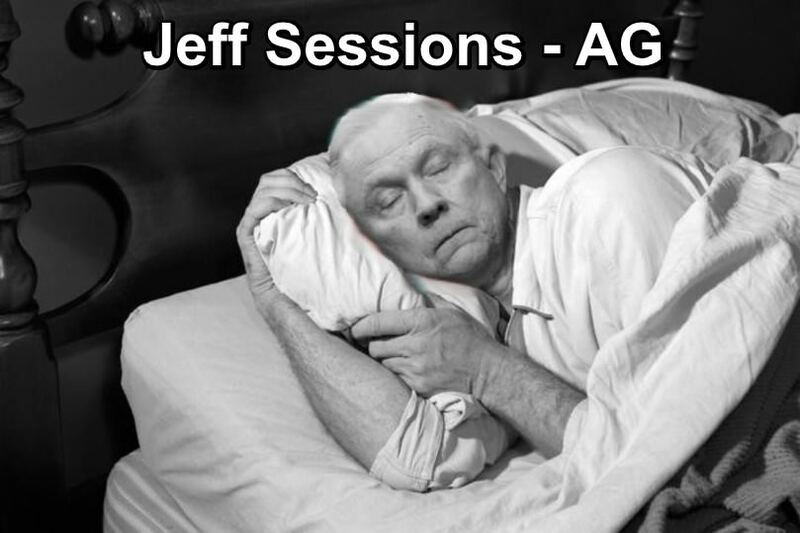 Seriously... where is the AG? Recusal excuse has become silly!!! We have lots of evidence of serious crime... probable cause for sure.. and far more than that. Surely it is past time for Grand Jury and INDICTMENTS. And also... legal opinion that Mueller probe was illegally set up... unconstitutional...people involved have disqualifying conflicts of interest etc. So WHY is the AG not declaring it at an end? Any legal action as a result of Mueller will be appealed/overturned?? Nunes and Gowdy, both Republicans, would attend the meeting with FBI Director Chris Wray, Director of National Intelligence Dan Coats and Principal Associate Deputy Attorney General Edward O'Callaghan. 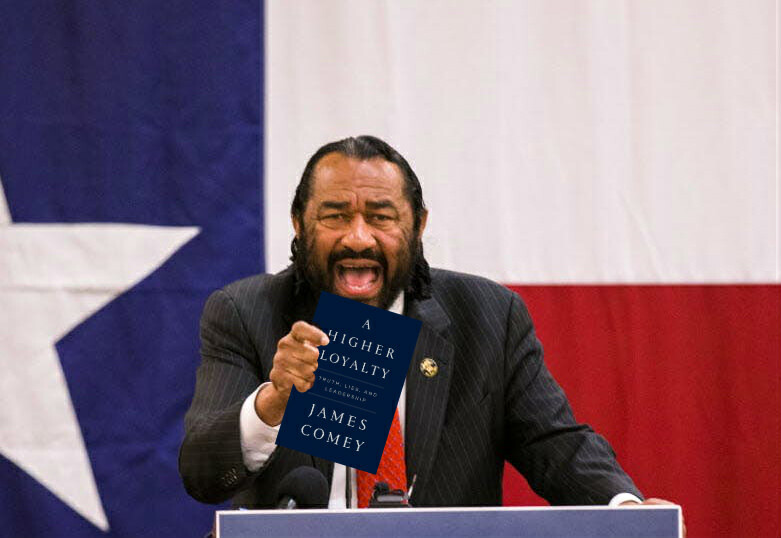 No White House staff will attend, and no Democrats were invited either. 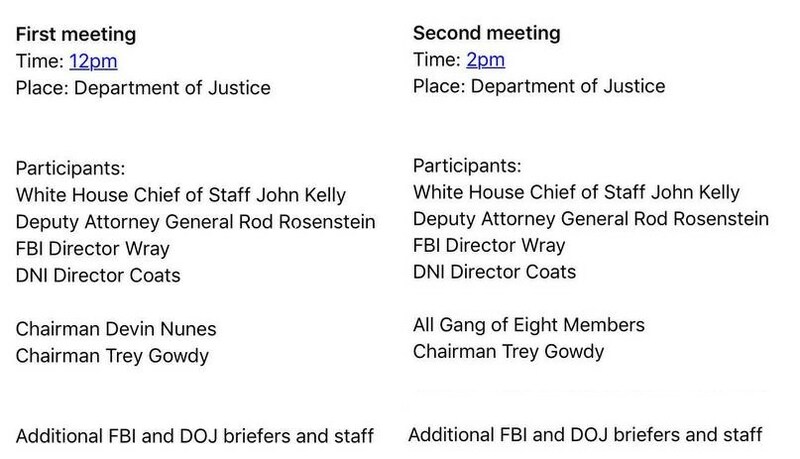 UPDATE 2: The DOJ says there will be two separate meetings Thursday. One is scheduled for 12pm ET, and another is set for 2pm ET. White House Chief of Staff John Kelly now appears to be attending both briefings whereas he was not expected to stay in the room, and Deputy Attorney General Rod Rosenstein is listed instead of Ed O'Callaghan. It is unclear why the Gang of 8, which has a higher clearance level than Rep. Trey Gowdy, would be included in a second meeting with him, and why a second meeting would be necessary at all. The reference to The Onion link is hilarious. I can remember thinking "Q" was something to keep up with. From just the little bit I see tweeted out, it is all foolishness and way too complicated to even look at. Plus I HATE RIDDLES and that's all it does. People get a kick (I guess) trying to figure out the answers. 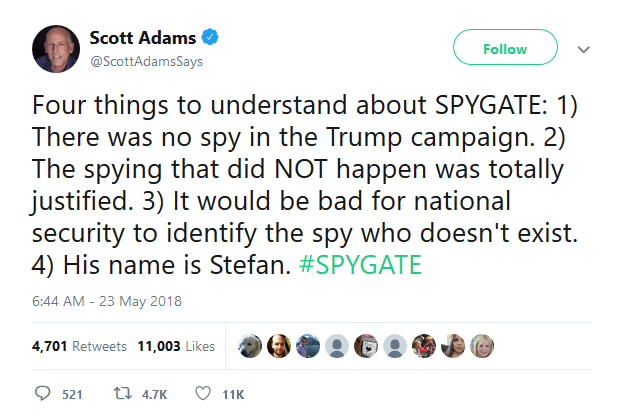 I think I will start watching a few Scott Adams' morning coffee shows when I have time. I can ALMOST understand the "rush of blood" to the brain that led some Obama Administration Dept heads and agents to "put a thumb on the scale" during the 2016 election. This was after all the OBAMA administration.. and Obama people.. at the top at least.. for 8 years... they were bound to be, inclined at least, to be supporters of Obama, his "legacy", continuation of his "policies" (vision), and his successor. Add to that.... HILLARY was regarded as a "certain winner" anyway and so people may well have seen no harm in an assist for her. "Not really cheating" because she was always going to win anyway. And TRUMP DERANGEMENT (REAL HATE) was very real for many people ... and it still is. However... people must have been blind or so badly afflicted by TDS that they would do what they did for...... HILLARY?? Jim Jordan for SPEAKER... soon... don't let Ryan dribble on. Donald Trump is set to visit the underground bunker from which Winston Churchill masterminded the defeat of Nazi Germany when the US President visits Britain in July. Mr Trump's visit to Britain is likely to combine his interests in Winston Churchill and golf, and could also see him have tea with the Queen. 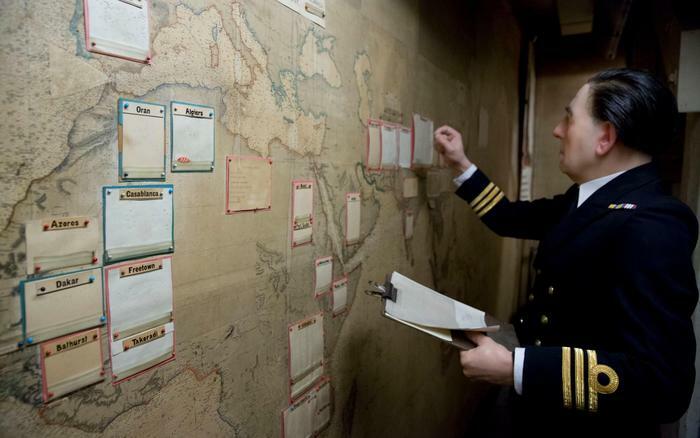 The President’s itinerary is now being prepared and it is understood that a trip to the Churchill War Rooms, in London, is one of the options under consideration. He is then likely to take on a sportsman at golf in Scotland. It was interesting (to me)... smaller spaces than you might imagine including the private living areas... small bed for Winston (and his wife).. small kitchen/dinning area.. where they apparently did host visitors as dinner guests even. Seems like I have watched a docu on this particular war room.